Flute, Harp, Fiddle, Accordion, Banjo, Bouzouki, Bódhran, Mandolin, male or female vocalist or Uilleann Pipes. 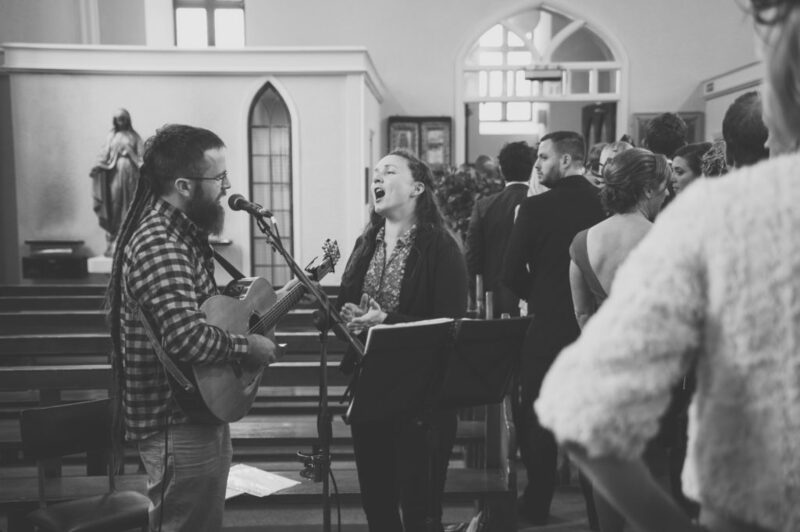 Combined their vocal ability and musicality has been described as ‘spine tingling’ , their emotionally charged delivery is guaranteed to set the perfect tone on your wedding day. Amber Moon played at both the church and reception part of our wedding. We loved how they could adapt their music and approach to suit each location. They were at both locations ahead of time, equipment was setup before anyone arrived and the music was unbelievable. The thought they put into each song and also how they performed it really kept us and the crowd happy! All of our requested songs were played and to a high quality.They also added more fun to the night with their positive attitudes and witty sense of humour. Amber Moon played at the church part of our wedding. They did simply an amazing job. Our wedding guest book has several mentions from our guests about the amazing music provided in the church. They played everything we wanted to hear on our wedding day and were a pleasure to work with. Simply amazing, highly recommended. Amber Moon, thank you so much for adding so perfectly to our wedding ceremony. From our initial meeting with you we were at ease, and your guidance where we weren’t sure was very welcome. Everyone commented on how special the music was on the day, and we thoroughly enjoyed it all. AnneMarie’s voice was amazing for the entrance song, and the instrumentals were brilliant. We wouldn’t change a thing about it, for us it was just perfect! We will recommend you to all our friends. Thanks again. © 2016 Amber Moon Music, All Rights Reserved.